servants of Christ – God's Grace ~ God's Glory! I was honest in answering, “No, I don’t think I would.” My vision of marriage was like most other twenty-two-year-olds. He was the man I wanted to spend my whole life with, but no thoughts of ill health for either of us was in my mind. I was selfish then, and had I known, I would not have committed to such a marriage that would require being a servant for the rest of my life. Years of learning the true meaning of life brought me through different stages of serving others, then to the point eleven years ago, with his amputation, to the reality that I would be Jerry’s caregiver for the remainder of his life. Unless the Lord brought me to this place, I would never have known the joy of being His servant. References are from Colossians 1:27; Ephesians 3:16-17; and Colossians 1:11. This is the means of our hope ~ Christ living within, in whom is all our hope for now and for eternity. This is my life. Two main areas of service are Jerry, first, and then, Home. Everything else falls into the category of Other. Christ is the center of all, shouldering all for me that Jerry needs. He is our strength and shield. Under the Almighty arms of Jesus are all we need for the care of our home. And according to His will working in us, we are enabled to care for the other things. Some of these may be ongoing; others may be on the spur of the moment. Except for posts on this blog, writing was put on hold this year. According to His will, and in His timing we will continue publishing our books. When asked, “How do you do what you do, joyfully?” ~ Joy and praise are part of a life of thanksgiving for all that Christ has done for us. Sacrifice for Jerry and others is the only reasonable response. As in life, so, in Bible study and the preaching of God’s Word we sometimes stray off the main path, forgetting where and how we started, and losing sight of our purpose and goal. So, before I post my notes on Romans 14, I want to again look back to our starting point, and look forward to the purpose that Paul set in the beginning. This will give us a better understanding of where we are in the application of Paul’s letter in this chapter. “For I am not ashamed of the gospel of Christ: for it is the power of God unto salvation to every one that believeth; to the Jew first, and also to the Greek. The first point we remember is that it is the power of God through His own word ~ the power of the gospel by His Holy Spirit ~ that brings us as sinners from our horrible state, to faith and repentance to live in the state of righteousness. In faith the righteousness of Christ is revealed. The nature and disposition of Christ is exemplified in those who believe. The power of God is able to bring His people to Himself with the purpose of our living in “obedience of faith.” This purpose for Paul’s letter to the Romans was stated in the first and last chapters. The power of God brings us into the state of being “righteous” in Christ. Being “righteous” means that we are not only “right” in Christ, but that we are actively living righteously; seeking and praying to do what is “right” in God’s sight through Jesus Christ, our righteousness. (Hebrews 13:20-21; 2 Corinthians 5:21) This is obedience of faith. This active obedience is proof of the gift of faith that is by His grace working in us. Everything focuses and keeps us riveted and holding on to Christ and not our own work or abilities. With these thoughts before us, focused on Him, let us get back to this path of righteousness with Paul in chapter 14. He has brought the attention to what it means to fulfill the law; of doing what is right, and of obedience to God. He has in the previous chapter zeroed in on this, in the main area by which all our righteousness is expressed. All of the law was based on love for God and for man. That which man was unable to do by the law was made possible through the power of God in the gospel of our Lord Jesus Christ. Again, man’s ability to love as God means to love, through the law or the gospel, is not possible for man, but only by the power of God working in the lives of those He has brought to faith and repentance through regeneration. This great love that Paul spoke of in Romans 13 is shown to work out in relationships between believers. The love is initiated by God. In Christ that love penetrates, is spread abroad and forms a new heart, saturates, and perpetuates this love toward God and toward others. Called to be Servants, Not Judges. He speaks to the whole church in Rome; to the weak and the strong in faith. The main principle of love makes no distinction in relationship with Christ. When He is the center of the body of believers each one is answerable to Him. The state of righteousness excludes none who are seeking to serve Christ through faith. We live in Christ, in His righteousness, to serve Him and one another. We are clothed with His righteousness so as to exclude all self-centeredness. Therefore, in differences of opinion, we do not strive to make our liberty known, so as to influence those who are weaker in the faith to sin against their own conscience. In private life we may be free to indulge in a freedom not yet known to a weaker brother; but not exercise such a freedom in public; which is to exercise our pride. Neither is free to judge the other for what they do or what they do not do. We are not called as judges, but as servants. To keep another from stumbling we, in love and humility think of Christ first, and what would glorify Him, and by out actions build up our brother in Christ. The main point in Romans 14 that keeps us on the path of righteousness, progressing in our obedience of faith, is verse 17. 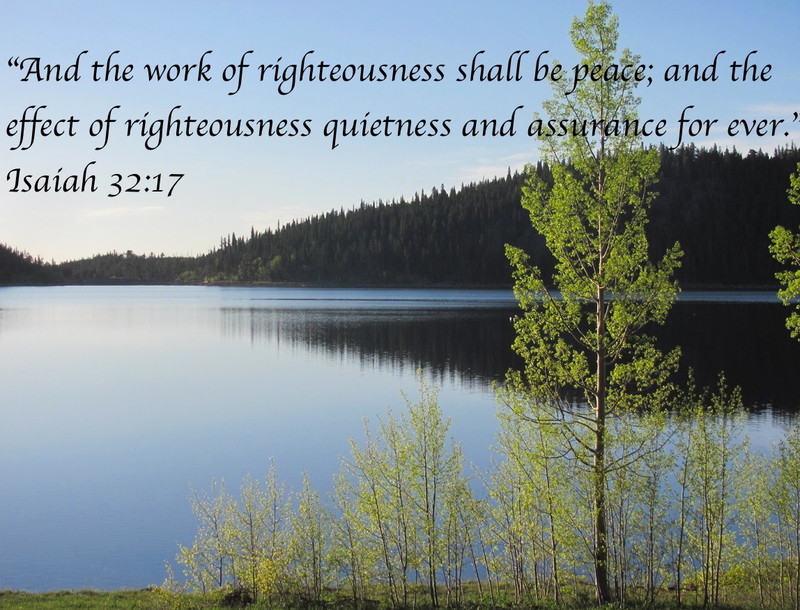 Where there is righteousness there is peace. If we are actively seeking the kingdom of God and His righteousness our life will not be about food and drink. Peace and joy in the Holy Spirit follow the fruit of love that He produces through us. Dear Father, you knew our need before you created us. Continue to work in us this love, joy, and peace that is ours in Christ, by the power of your Holy Spirit, for your glory and more joy. In Jesus’ name I pray. Amen.